Viet Nam's National Assembly (NA) praised the practical agenda of the 33rd ASEAN Inter-Parliamentary Assembly (AIPA), especially the planned discussions on regional security matters such as the East Sea issue. Vietnamese NA Vice Chairwoman Tong Thi Phong made the statement yesterday at the first plenary session of AIPA's 33rd General Assembly in Lombok, West Nusa Tenggara province of Indonesia. Phong reinforced the NA's pledge to continue making practical and effective contributions to raise AIPA's role towards an ASEAN Community of peace, security, stability, cooperation, development and prosperity. She noted that ASEAN member countries are making every effort and taking determined moves to strengthen cooperation and boost connectivity towards a strong ASEAN community by 2015. In this process, Viet Nam applauds and actively participates in promoting cooperation among ASEAN member countries and its outside partners, she said. This aims to maintain peace and stability for mutual development as well as effectively cope with emerging challenges, such as economic development gaps, natural disasters, climate change, food and energy security, disease prevention, trans-national crime, smuggling, drugs, and international terrorism. She called on AIPA to actively assist ASEAN member countries in continuing their efforts to strengthen cooperation, solidarity and consensus in addressing challenges to peace, security and stability. In addition, AIPA should support ASEAN in fostering the "law enforcement culture" to encourage member governments to seriously implement their ASEAN priorities and commitments, she added. AIPA President Marzuki Alie said on Monday that cooperation between AIPA members is now essential as ASEAN faces many traditional and non-traditional challenges. These challenges include economic development gaps, natural disasters, climate change, trans-national crime and international terrorism, noted Marzuki Alie, who is the Speaker of Indonesia's House of Representatives. This requires greater cohesion between people in ASEAN and greater efforts to turn the leaders' political will on ASEAN integration into the will of all people living within the bloc, he said. According to Marzuki, the 33rd AIPA General Assembly will discuss issues of AIPA's political, economic, social, organisational and operational matters, as well as the challenges and opportunities the organisation faces when strengthening inter-parliamentary cooperation in the region. Cambodia's Prime Minister Hun Sen, who is also Chair of ASEAN for 2012, stressed that AIPA member countries have consolidated and hastened ASEAN integration as AIPA connects people across the region and shares the common goal of creating a peaceful, stable, secure, developed and prosperous ASEAN. Before the plenary session, Phong paid a courtesy visit to AIPA President Marzuki Alie, and later met delegation heads from Cambodia, Belarus and Russia. While meeting with Speaker of the Cambodian Parliament Heng Somrin, Phong expressed her wish to increase cooperation and experience sharing between the two legislative bodies to improve the role and efficiency of their law making enforcement. In reply, Heng Somrin said he believes that with their firm bilateral cooperation foundations, the two countries will make greater contributions to peace, stability and development in the region and the world at large. Meanwhile, the Belarusian and Russian parliament leaders vowed to strengthen relations with the Vietnamese NA in particular and with AIPA in general, to consolidate the central role of ASEAN in the evolving East Asian architecture. Earlier on September 17, Phong met with the Speaker of Brunei's Legislative Council, Pehin Dato Isa bin Ibrahim, the Deputy Director of the Foreign Affairs Bureau at China's National Assembly Zha Peixin and Victor Ortega, the head of the parliamentary delegation from the Philippines. The Brunei, Philippines and Chinese officials praised the Vietnamese NA's important contributions to national construction, development, economic restructuring and modernisation. The Vietnamese NA Vice Chairwoman stressed the need to increase cooperation between parliaments and their committees as well as the civil organisations of these countries. The Vietnamese Government wants to national defence cooperation with Cuba, especially in military technology, army building and officer training, said Prime Minister Nguyen Tan Dung. PM Dung made the statement while receiving Vice Minister of the Cuban Revolutionary Armed Forces, Sen. Lt. Gen. Joaquin Quintas Sola, in Hanoi on September 18. He said Mr Sola’s current working visit to Vietnam will contribute to promoting the two countries’ cooperative relations. He stressed that Vietnam will exert its utmost to implement agreements reached between the two countries’ leaders to make bilateral cooperation, particularly in economics, more practical and effective. 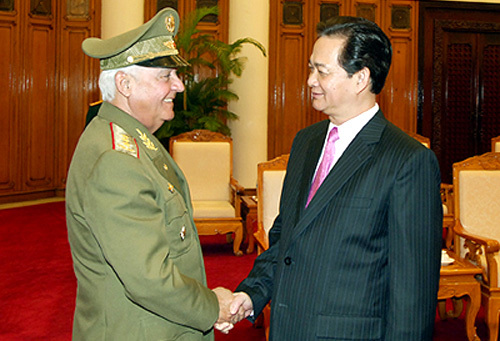 Sen. Lt. Gen. Joaquin Quintas Sola said Cuba always considers Vietnam’s achievements as a great source of encouragement to its national construction and development. He said his visit aims to beef up the friendly cooperation between the two countries in general and the two armies in particular. He expressed his hope that Vietnam will cooperate and share experience with Cuba in socio-economic development and national construction as well as in the army building and development. A delegation from the Communist Party of Vietnam (CPV) met with leaders of the Communist Party of the Russian Federation (KPRF) and the ruling United Russia Party (ER) within the framework of its Russian visit on September 17-18. The delegation was led by Dinh The Huynh, Politburo Member, Secretary of the CPV’s Central Committee and Head of the CPVCC’s Commission for Popularization and Education. At a meeting with Gennady Zyuganov, Chairman of the KPRF Central Committee, the two sides exchanged information on situations of each country and each party, as well as their cooperation. Zyuganov expressed his hopes that the traditional friendship between the two parties and peoples will be further consolidated and developed in the near future. At a meeting with Dmitry Travkin, Permanent Secretary of the ER Central Committee, the two sides reviewed each country’s socio-economic development and shared opinions on major socio-political events in Southeast Asia, the Asia-Pacific and the world. They highly valued information exchanges to contribute to strengthening mutual understanding and tightening the cooperation between the two ruling parties, adding that the parties should make more efforts to further intensify the traditional friendship, comprehensive strategic partnership between Vietnam and Russia, helping consolidate peace, cooperation and development in the region and the world. Travkin stressed that the two parties need to expand their cooperation and direct exchanges, firstly between all-level leaders and young Party members. The Vietnamese delegation head affirmed the country’s Party, State and people always attach importance to developing the relations with Russia, which holds a very important role and position in international relations. He expressed hopes that the two ruling parties’ relations will contribute to strongly promoting the comprehensive strategic partnership between their countries. Earlier, the delegation visited “The Truth” (Pravda) newspaper of the KPRF and the Vietnamese Embassy and met with Vietnamese correspondents in Russia. Vietnam is eager to make practical and effective contributions to increasing the role of AIPA in establishing a peaceful, secure, cooperative, developed and prosperous ASEAN Community. Vice Chairwoman of the Vietnamese National Assembly Tong Thi Phong made the statement on September 18 at the first plenary session of the ongoing 33rd General Assembly of the ASEAN Inter Parliamentary Assembly (AIPA) in Lombok, Indonesia. Phong said AIPA 33 took place in the context of various challenges currently confronting the global economy. There are not many positive signs of economic recovery, she said, adding that some regions are now facing complex security and political situations that are threatening peace, stability, development, and prosperity within the region and across the world. She said Vietnam will join hands with other ASEAN member nations to establish a strong and united ASEAN community by 2015 through promoting cooperation and building mutual trust within the bloc, as well as between ASEAN and its partners, for the sake of peace and development. Vietnam will work closely with other ASEAN nations to deal with traditional and nontraditional challenges such as the regional development gap, climate change, and natural disasters. Phong went on to say that the country will aim to ensure food and energy security, gender equality, and women’s and children’s rights; and also strive to prevent epidemics, transnational crime, drug trafficking, and international terrorism. She voiced Vietnam’s support for ASEAN’s efforts to expand its relationships with partners and uphold its centrality in shaping the East Asia regional architecture. She described the assembly’s agenda as practical, as it seeks ways to deal with security challenges, including ongoing East Sea issues, and promote ASEAN’s socio-economic targets such as boosting green economies, creating a harmonious legal framework for small- and medium-sized enterprises, coping with the impact of climate change, and increasing the effectiveness of AIPA activities. Phong also called on AIPA to help consolidate solidarity in dealing with challenges and cooperation between the governments of ASEAN member nations. She suggested that the Assembly improve the effectiveness of dialogues such as the ASEAN Regional Forum (ARF), ASEAN+1, ASEAN+3, the East Asia Summit, and the ASEAN Defence Ministers’ Meeting Plus (ADMM+), as well as other tools to ensure peace and security in the region including the Treaty of Amity and Cooperation in Southeast Asia (TAC), the Declaration on the Conduct of Parties in the East Sea (DOC) toward the building of a Code of Conduct in the East Sea (COC). On the same day, Vice Chairwoman Phong paid a courtesy visit to Marzuki Alie, Speaker of the Indonesian House of Representatives. The 30th meeting of the Vietnam-Cuba Inter-governmental Committee opened in Havana on September 17. Addressing the meeting, Cuban Minister of Foreign Trade and Investment Rodrigo Malmierca Diaz praised bilateral cooperation over the years and reaffirmed that Cuba is committed to consolidating the special relationship, loyal friendship, and comprehensive cooperation with Vietnam, governments and peoples, especially after Party General Secretary Nguyen Phu Trong visited Havana last April and President Raul Castro visited Hanoi last July. Diaz, who is also Chairman of the Cuba-Vietnam Cooperation Subcommittee, reviewed the implementation of signed agreements and said both nations aim to upgrade economic cooperation to be on a par with their political relationship. He hailed both sides’ efforts to settle debts, especially their businesses reaching an agreement on the payment method. Diaz also said he hopes that Vietnamese businesses will continue investing in Cuba, particularly in oil exploration and exploitation, renewable energy, tourism, information technology, and agriculture. Vietnamese Minister of Construction Trinh Dinh Dung reaffirmed Vietnam’s consistent policy of backing Cuban people’s revolutionary cause and highlighted their special solidarity and great support for Vietnam’s past struggles for national independence and present construction of a wealthy, democratic, equal, and civilized country. It reflects Vietnam and Cuba’s determination to nurture their special traditional relationship, Dung noted. He said Vietnam is paying attention to the areas of Cuba’s strengths, including bio-technology, saying that it is willing to help the Latin-American nation develop agricultural projects to ensure food security. Dung, who is also Head of the Vietnam-Cuba Cooperation Subcommittee, said Vietnam will do its best to promote bilateral cooperation in economics, trade, culture, education, and science and technology, as expected by both Parties and peoples. On the same day, Minister Dung was received by Vice Presidents of the Council of Ministers, Ricardo Cabrias and Marino Murillo, who were very pleased with the outcome of the meeting. A meeting was held in Vienna, Austria on September 12 to mark the 40th anniversary of Vietnam-Austria diplomatic ties (December 1) and 67th anniversary of Vietnam’s National Day. Present at the event were Austrian President Heinz Fischer and his spouse and Vietnamese Minister of Health Nguyen Thi Kim Tien. Minister Tien thanked the Austrian government for its support to Vietnam’s past struggle for national independence and reunification. She highlighted the positive results of cooperation between Vietnam and Austria over the last four decades in economics, trade, investment, culture, health care and education and training. She affirmed Vietnam’s policy of continuing to expand cooperation and friendship with Austria, one of its important EU partners. After the visit to Vietnam by Austrian President Heinz Fischer in May, the two countries’ relations have continued to grow and flourish, Tien added. For his part, Martin Eichtinger, Director General for Cultural Policy at the Austrian Foreign Ministry, affirmed that his government’s commitment to providing further support to Vietnam’s renewal process as well as sharing experience with Vietnam in national industrialisation and modernisation. A performance of Vietnamese royal court music with artists wearing Ao dai traditional dress was held after the meeting. Participants at the sixth meeting of the Viet Nam-Indonesia Joint Commission on Economic, Scientific and Technological Cooperation held in Jakarta, Indonesia, on Sept 17-18, agreed to strengthen economic and technology cooperation for mutual benefits and towards a strategical partnership. At the two-day event, the two sides discussed exchange activities in the fields of trade, industry, agriculture, energy, health, eduation, transport, finance, banking and tourism. Viet Nam 's Minister of Industry and Trade Vu Huy Hoang and Indonesian Minister of Trade Giata Irawan Wirjawan co-chaired the meeting, in which they agreed to work further on the draft of an MoU on information sharing and protective trade policies between the two countries. The two sides also pledged to support each other at international and regional forum such as APEC, ASEAN, and the WTO. The two ministers signed a protocol to amend the Memorandum of Understanding on rice trading between Viet Nam and Indonesia. In the document, Viet Nam had agreed to sell up to 1.5 million tonnes of white rice to Indonesia each year from the start of 2013 to the end of 2017. Regarding energy, oil and gas and coal mining, Viet Nam proposed that Indonesia facilitate PetroVietnam's existing oil and gas exploitation projects with its Indonesian partners, including the Natuna D-Alpha project. Both sides encouraged PetroVietnam to increase cooperation in exploiting crude oil, gas and coal as well as providing oil and gas services in Indonesia. On investment, both sides encouraged cooperation in investment promotion through sharing information on foreign investment policy and environment, and planned to exchange delegations to grasp investment opportunities in both countries and train foreign investment management staff. The Indonesian side welcomed the involvement of Vietnamese importers and investors in the mining sector in Indonesia and proposed that the nation supply thermal coal to Viet Nam's power plants and import high-carbon anthracite coal from Viet Nam. In terms of fisheries, both sides reaffirmed the importance of fishing cooperation in each country's economic growth, and encouraged bilateral cooperation between the two countries and among localities in the field. As for agriculture, they agreed to speed up the signing of an MoU between Indonesia's Ministry of Agriculture and Vietnamese Ministry of Agriculture and Rural Development to lay foundations for cooperation in food diversification and reserves. The Vietnamese side acknowledged Indonesia 's proposal to establish an agency to manage Robusta coffee supply sources and a mechanism for coordination in Robusta coffee exports. The two ministers agreed that the next meeting will be held in Viet Nam in the next three years. Earlier, on Sept. 17, Minister Hoang had a meeting with Indonesian Minister of Energy and Mineral Resources Jero Wacik to discuss bilateral cooperation in the areas of energy, coal and minerals. The Vietnamese Government and the International Francophone Organisation (OIF) have agreed on preferential rights and exemptions for the organisations recently opened regional headquarters in Viet Nam. The agreements, which solidify the role of the OIF's Regional Bureau for Asia and the Pacific (BRAP), were signed on September 18 by Deputy Foreign Minister Nguyen Phuong Nga and BRAP Director Anissa Barrak in Ha Noi. BRAP's new tasks include promoting the Francophone community in the Asia-Pacific region as well as promoting the resources and capacities of regional countries and institutions in policy making. After setting up its regional office in Viet Nam, OIF has actively engaged in cooperation with Viet Nam and other countries in the region, contributing to promoting the image and values of the Francophone community as well as the French language in Asia.